In her psychotherapy practice, Hilary Jacobs Hendel, GSS ’04, once encountered a patient who seemed incurably depressed. Medication, hospitalization, all kinds of therapy—he had been through it all. What helped him recover, it turned out, was emotions, in particular the sadness and grief he had buried. Once he learned to fully experience them and manage them, he eventually recovered—making friends, making changes in his life, and feeling alive again. Hendel wrote an article about the technique she had used, and something happened. Published in The New York Times in 2015, it rose to the top of the most-emailed list, prompted a flood of appreciative emails, and drew the interest of a literary agent. 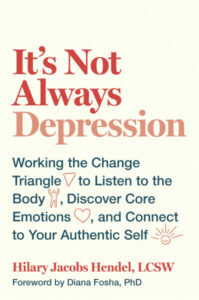 At his urging, she wrote a book that was published this month, titled It’s Not Always Depression: Working the Change Triangle to Listen to the Body, Discover Core Emotions, and Connect to Your Authentic Self (Random House and Penguin UK, 2018). The book describes techniques developed more than 20 years ago by the psychologist and author Diana Fosha, Ph.D., to help people mentally engage with latent emotions and move past traumas that may be stubbornly holding them back. So far, no one has written a book about these techniques for the general public, Hendel said. Judging by the response, people are ready for one. “Depression is a huge problem,” along with treatment-resistant depression, so it strikes a chord when readers learn that “it’s not always depression, that there’s something at the root of it,” she said. The daughter of a former guidance counselor and a psychiatrist, Hendel grew up with the “mind over matter” idea that emotions are to be mastered “with intellectual insight,” as she puts it in the book. But in 2004, after earning her master’s degree in social work at Fordham’s Graduate School of Social Service and preparing to earn her psychoanalysis certification, she learned of a different approach—accelerated experiential dynamic psychotherapy, or AEDP. She saw Diana Fosha present AEDP at a conference and wanted to start practicing it as soon as possible. It calls for learning to viscerally experience core emotions—anger, sadness, joy—that are blocked by shame or other defenses. It reflects a view of emotions as biological forces that, when stymied, throw the body and mind out of balance. By showing people how to continually access these emotions, Hendel felt, AEDP could help them permanently heal. The book is a jargon-free guide to AEDP techniques for anyone. “Basically, I just want to teach [readers]about emotions” and make them less scary and less mysterious, she said. In the book, she tells of patients (with their consent) who are struggling with social anxiety, irritability, feelings of depression, and other troubles. Typically, patients are encouraged to notice any faint physical reactions—a tightness in the diaphragm, a clenching of fists, a tear in the eye—that signal core emotions linked to trauma, such as childhood neglect or a parent’s verbal abuse. They learn to get comfortable with the experience of these emotions, exploring them with curiosity and compassion. The emotions may have been buried under shame, guilt, and anxiety during childhood—because of the emotions’ frightening power, and because it was less scary to blame themselves for what they were feeling than to find fault with the adults they were dependent on. During therapy, a patient might imagine speaking to her childhood self and offering comfort, or rebuking whoever inflicted the trauma. Anger or harsh words may flow, along with copious tears, as with the patient anonymously described in Hendel’s New York Times article. The goal is to unblock the emotions by growing comfortable with how they physically feel. Patients can also unblock positive core emotions like joy and excitement and gain confidence. The Change Triangle, Hendel’s own visual model for the AEDP process, is centered on core emotions and the openhearted, authentic self they can help bring out when patients learn to access and control them. Treatment times vary. Change can come quickly, or it can take years, Hendel said. The book’s title reflects a view that what seems like depression—“a word that we’ve put on a constellation of symptoms,” Hendel said—may in fact be a more specific problem that stems from an experience that can be addressed. She hopes the book will help create broader awareness of how to manage emotions, something she considers to be a public health issue.